I was raised doing farm work in the late 1940s through the early 1960s when I graduated from Sabetha Kansas High School. My granddad was my mentor for everything – mechanics to woodworking – and he had a great shop. At age 7, he had me driving his two 8Ns. One, named “Tuffy,” had a loader on the front and the other, “Bessie,” was unencumbered. Gramps usually ran Bessie since it was easier for him to get on. It didn’t really make a difference which tractor I drove, so long as I got to drive one or the other. When my dad heard I was driving Gramp’s 8Ns, he put me on his Farmall M. I was a little squirt and the tractor was big for me. From the start, it was not my favorite, much to his dismay. We pretty much grew everything on our two family farms. Corn, wheat, oats, alfalfa, clover, and brome hay were all in the mix. For implements, my granddad had the Fords with related equipment. He even had one of the first Ford balers that had the swing fork. I got to help the dealer set it up. He explained the knotter and other working parts, which were really cool and came in handy later in life. Gramps traded Bessie for a Jubilee – a great upgrade for sure. All his Fords had Sherman over-under transmissions, which made the tractors extremely usable, regardless of the load or job. At age 12, I learned how to run Massey combines, and that was a real blast as well. All I wanted to do at that time was combine or plow. Milking cows was a way of life, along with raising pigs and chickens (meat birds). Everyone pitched in on “butcher day, “ including my great-grandmother. The auger collector box was rusted away beyond repair, so a new box was fabricated using the old one as a template. 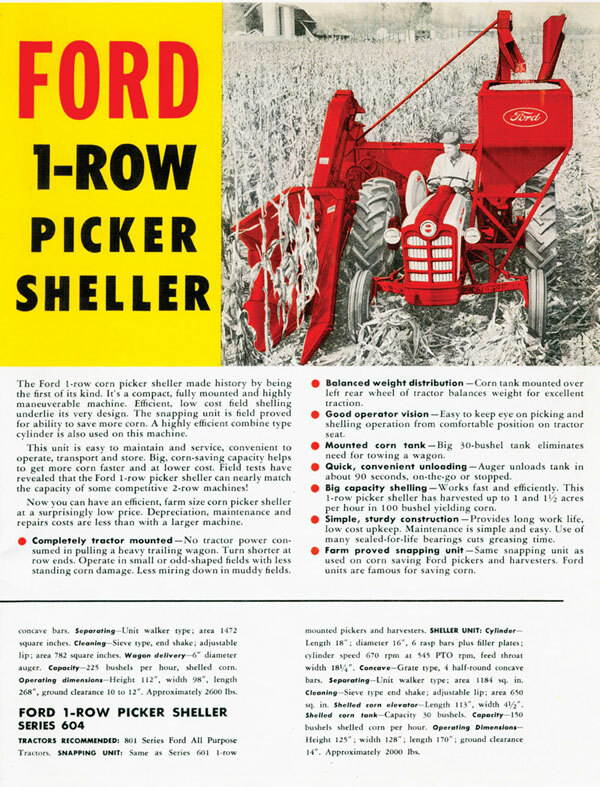 In 1973, I noticed an auction flyer that had a Ford one-row mounted picker-sheller listed. My granddad had farmed with Ford tractors, Dearborn row crop implements, a Ford hay bailer, etc. But, we had a Massey 2-row picker for the corn. I had never heard of a one-row picker, so out of curiosity, I went to the auction preview. When I saw it, I felt I had to have this machine as I had been picking corn with a one row New Idea unit. Having shelled corn would save a lot of storage space. I went to the auction and made the purchase for $35. With the help of the owner’s manual, I made the necessary preparations to a Ford 4000, mounted the unit, and away I went on a 54 mile round trip. I could not believe how easily this unit mated to the tractor. For the trip home, I put the grain bin for the unit on the trailer. The beginning of the teardown and the start of inventorying parts needed for a complete rebuild. Once I got it home, I greased it up and it ran with no problems. Upon closer inspection, I was amazed to see that the serial number was 1008, meaning it was the 8th unit built. That autumn, I harvested my field corn and was totally surprised to find very little shelled corn on the ground. After the field corn, I put it to the ultimate test and harvested popcorn and was just as pleased. I sold the New Idea picker, since it seemed Ford had the better idea. 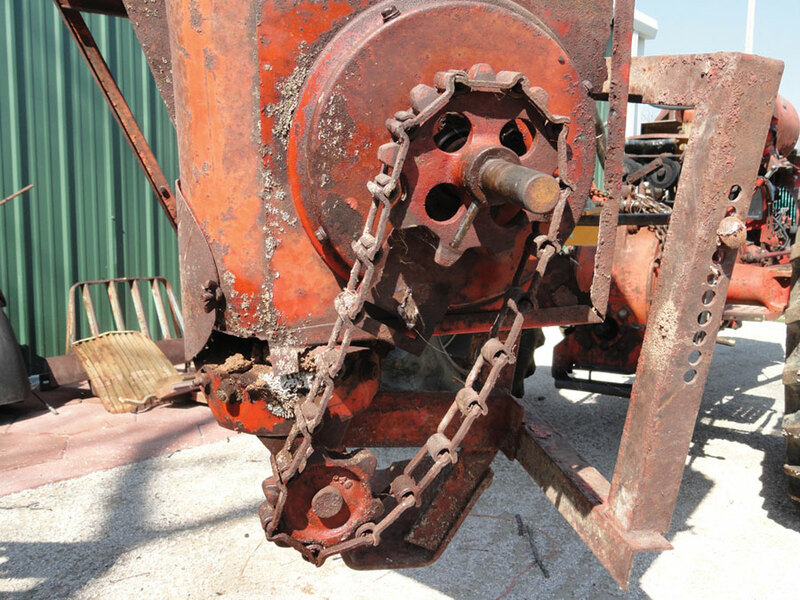 Mounting the picker-sheller was a piece of cake, compared to the cursed job of mounting dad’s 2MH on his Farmall M.
The unloading auger tube was in sad shape, so a new tube was obtained and the flighting, gears and chains were all salvaged. 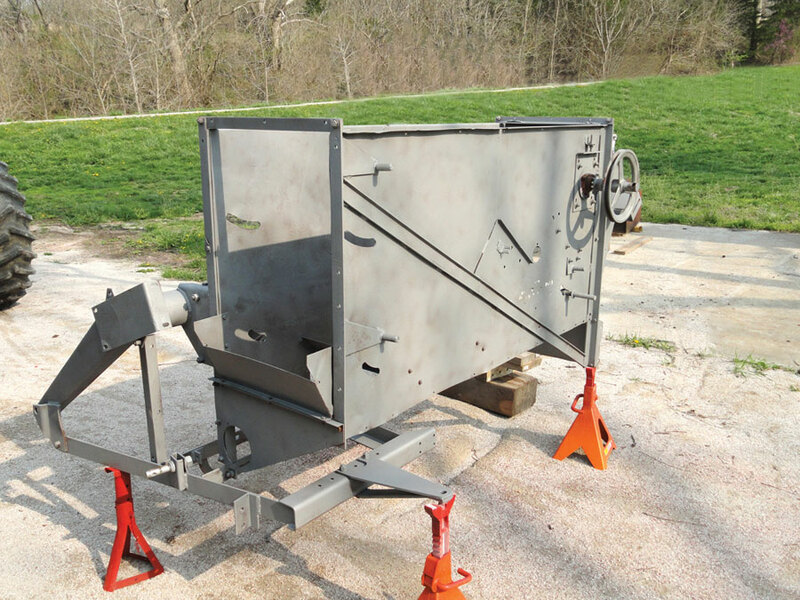 After the wheels are set out and the angle mounting hangers are installed with the ender bolts, it takes about 15 minutes to mount the sheller unit as it is three-point. The tank takes another 30 minutes or so with its mounting bracket. 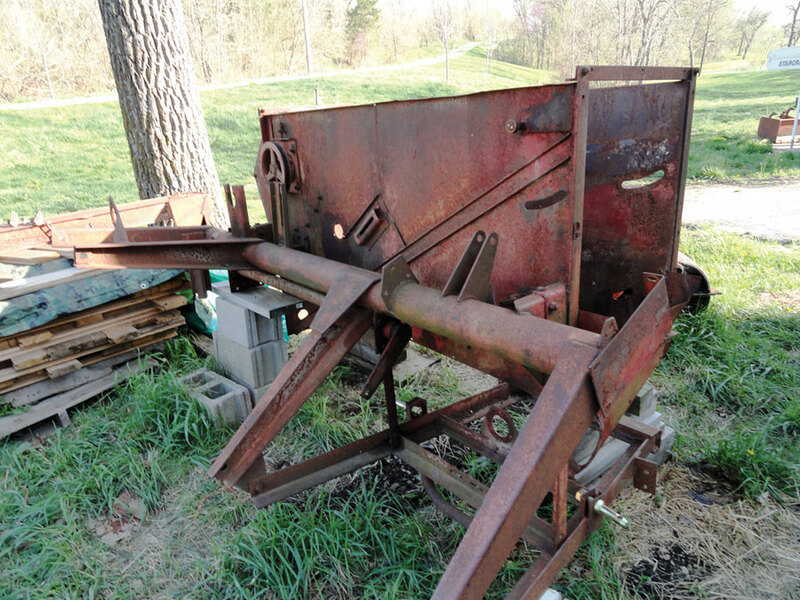 Due to unfortunate circumstances, I sold my farm equipment in 1979, and, begrudgingly, the picker-sheller as well. The guy that bought it just wanted the rubber snapping roller to put on his picker. For years, I tried to buy it back, but he refused, letting it sit in his field as a cattle rub. When he died, I finally bought it back at his estate auction for $35 without the owner’s manual this time. 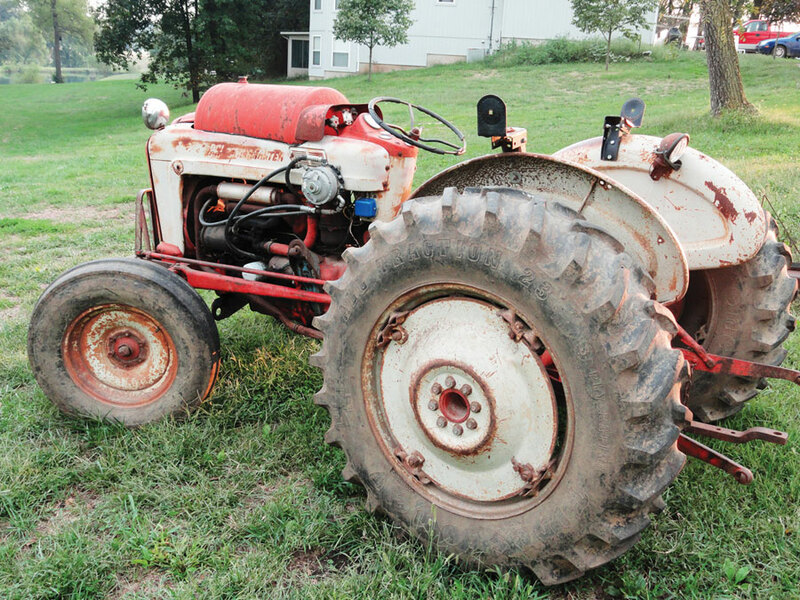 Yes, the 30 years in the pasture aged it a bit, but I was bound and determined to rehab this classic machine. This time, I only had a five-mile round trip to retrieve it. I did an assessment of the machine and of course, virtually all of the bearings were frozen. I shot them with some JB-80 lube and kerosene and finally got them to turn over. I knew the bottom auger pan was in need of replacement, as well as the lower auger flighting. 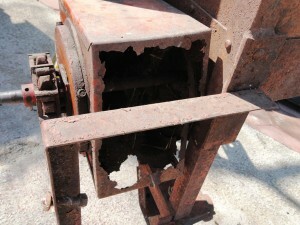 The grain pan and blower deflector were also in bad shape. I had a new auger pan, grain pan and blower deflector made using the old ones as patterns. And, yes, I found some of my popcorn cobs inside – the previous owner had never taken off the rubber snapper roller and it was in perfect shape. Primer coat on the main unit. During the teardown, I noticed the gearbox was stamped “April 1957.” I assume it was assembled then, but when it was actually delivered or to where, I do not know. The parts book shows the earliest units with maple wood sieve swings (like mine). Soon after, they switched to a metal swing with rubber bushings. I had decided to do the job right. I would totally tear it apart, sandblast, prime, paint and then reassemble. As this was done I took inventory of all bearings, belts and other items that needed replacement. It took a couple of months to find all the new parts to put it back together again. New original Ford decals were applied. I also located an owner’s manual, parts book and original sales brochure. The gathering chain sprocket bearings were not salvageable regardless of being sealed and no new sprockets (as well as many other parts) were available. After pulling the roll pin in the bolt, I drove the bolt into the pressed-in cover and popped it out of the sprocket. There are two C-rings that hold the bearing in – once removed, the bearing will come out and could be replaced. I got lucky and found two good sprocket shoulder bolts on a junked picker head. The picker head gear boxes were cleaned inside and out and refilled with new grease and oil. Overall, the picker head itself was in good shape. I did not pull the cylinder shaft or bearing on the sheller unit as the cast pulleys did not want to budge. I needle greased the two bearings and was able to salvage them. All other bearings, high speed chains, belts, and canvases had to be replaced. All parts were primed and painted before reassembly. The last step was to apply the final two coats. During the rehab process on the picker-sheller, I spotted a 1958 861LP on an auction flyer and decided it would make a good couple with the picker. The tractor had a stuck clutch, but the engine and transmission ran out very well and the price was better than right. After some towing and popping with the tractor in gear, I was able to get the clutch to release. Last year I was so excited to get the picker sheller to shows, I just did metal repairs and put a quick coat of paint on the tractor. This year, I took the tractor down, split it, sandblasted, primed and painted the whole thing. I also put in a new clutch as the old one was going to need replacing eventually. The front seal on the crank leaked a bit, so I pulled the front cover and the pan. I have no idea how many hours are on the engine, but due to it being an LP, I was only able to get about a teaspoon of sludge out of the pan. Finding original LP parts, like the double diaphragm regulator, carburetor and vaporizer unit, has been very challenging. If anyone has information on a supplier of these parts, I would appreciate it. Saving a piece of history is challenging but it is so neat when people say they have never seen a machine like this one before. Now, if I could only find a 2-row picker-sheller that could be saved! 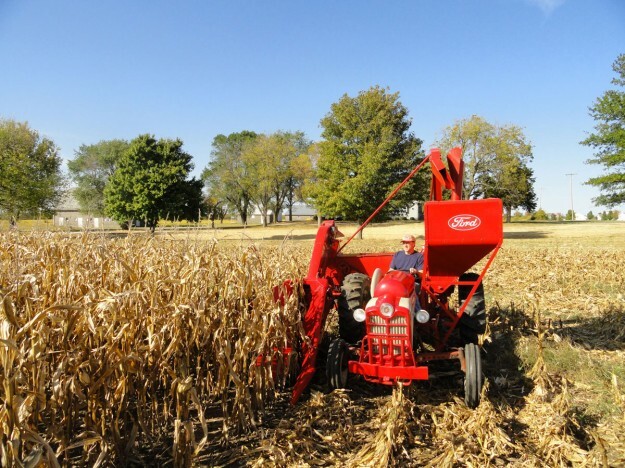 This entry was posted in Feature and tagged Ford 861, Ford Implements, Ford One-Row Picker-Sheller, Kansas by N-News. Bookmark the permalink.